Mosaic taken remotely with the fsq106 and sbig stl11000 one shot color ccd camera at the siding spring observatory in New South Wales, Australia. This image was taken over 3 consecutive days and consists of 4 panels. Each panel was made of 5 images of 15 minutes. So total effective exposure is 1.25 hours and 6 hours all together. 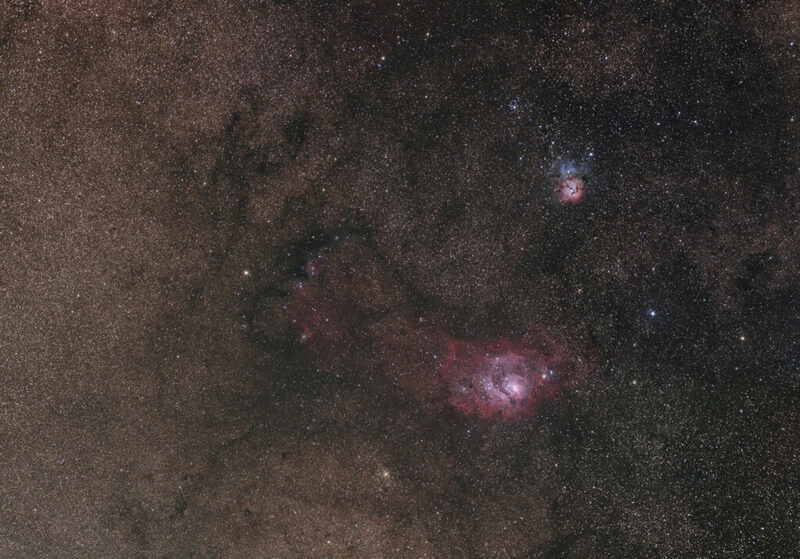 The image shows the region of m20 (trifid nebula) and m8 (lagoon nebula) near the milky way center. Thanks to the Tzec Maun foundation and Ron Wodaski for the support and opportunity to image on this system. The full image is 20 megapixel and near 25mb.